When I found out that Pillsbury was going to be releasing a line of gluten-free ready made doughs, I was like a little kid at Christmas. So when I was at my local Meijer and saw that the new doughs were in stock, I couldn't resist buying two of each kind. I know, I get a little too excited about food. Preheat oven to 400F. Grease a baking sheet with nonstick cooking spray. 1) Place dough on prepared baking sheet and roll or press out into a rough rectangle (about 12-15" long by 8-10" wide). 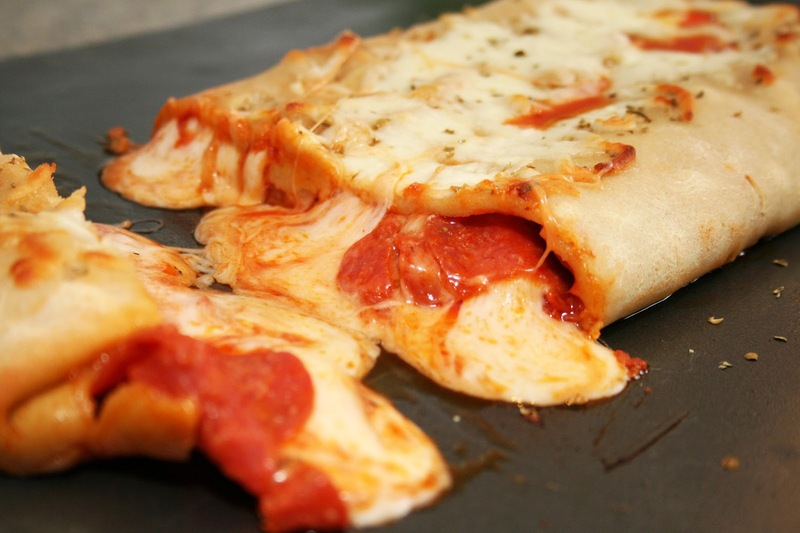 Don't roll the dough too thin or it will break while folding in toppings. 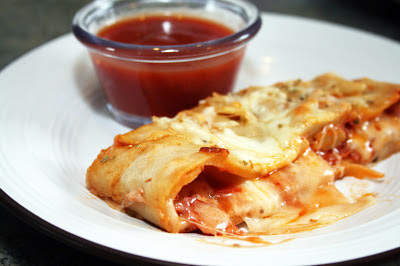 2) Cover the flattened dough with pizza/pasta sauce leaving 1-2 inches on each side. 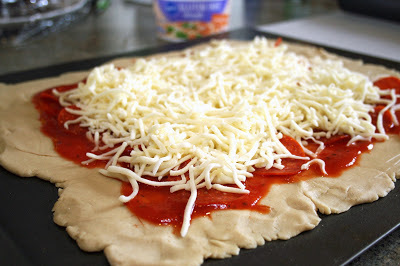 Add toppings and cover with shredded cheese. 3) Carefully fold the sides of the dough up to form a long wide roll. Pinch the two ends together to seal the ingredients in. Fold the ends of the dough up and press to seal. Be gentle with the dough as it does like to break. If you get any holes, try to press the dough back together to reseal. Top with some additional cheese and sprinkle with oregano. 4) Bake for 12-15 minutes or until dough is a nice golden brown and cheese is melted. Let cool for about 5 minutes before cutting and serving. Serve with additional sauce for dipping. I'm happy to hear it's good. I can't eat anything with soybean oil so I won't get to sample it, but still, nice for convenient and tasty options to be out there. That's unfortunate! Hopefully they'll come out with a similar product without the soy for those with that type of intolerance. I was definitely impressed with this dough though! Samantha, I was very happy with the dough in every way! 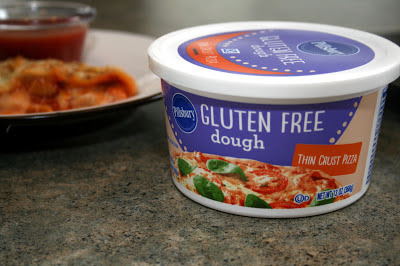 You can check out Pillsbury's website to see if you can locate a store near you (http://www.pillsbury.com/products/gluten-free), however I don't think it's entirely up to date. I found this at Meijer and it isn't listed as carrying the product yet. So excited for this! It's not located in any stores near me yet...can't wait for it to be available! I made this for dinner tonight, it was SOOOOO good!! 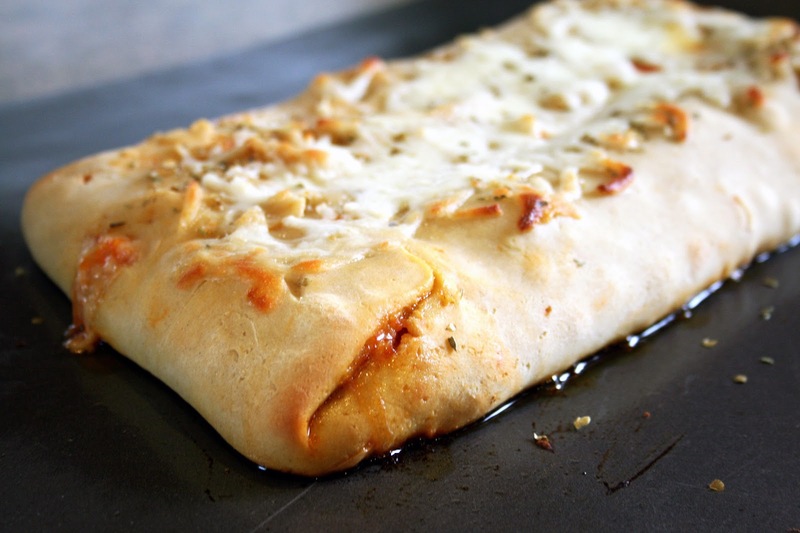 I can't remember the last time I had Stromboli! Even my gluten eating husband and daughter enjoyed it! Thank you!! This makes me so happy! I haven't seen them in my stores yet. Did you find it in the refrigerated area where the other Pillsbury ready-made doughs are? I was very excited when I found them! They are by the rest of the refrigerated doughs. Just keep checking your store, I'm sure the doughs will be there soon! Aly, I am in Michigan. Have you tried calling your local store? I would imagine these products will reach your area soon if they're not there yet! Thanks Andrea. Looks like I will need to be patient! This turned out really good! My daughter likes anything made with wing sauce and since she is such a good egg about eating gluten free just because mom does, I made a buffalo chicken stromboli. I would also recommend the pie crust. But keep it chilled just like regular dough or it doesn't stretch well. I used it to make apple dumplings - YUM! I am really happy to have this in my arsenal for Thanksgiving as I usually make but don't eat the pies! Thanks for your realistic (not lazy) recipes and keep 'em coming! That's great to hear! That sounds like a delicious twist on stromboli, I like your creativity.